Yahoo is regarded as second to Google when it comes to home pages and search engines among most folks in the West. In Japan, Yahoo is the bee's knees to Google's bee's, uh, little toes. This is why Yahoo gets its own brand of corn snack. Well, not exactly its own. This is a collaborative effort between Maruchan, maker of cup-a-ramen type products, Yahoo Japan, Frito-Lay, and Tokyo Web 1 Week (a magazine). They all came together to create some sort of promotion which would draw attention to all of them. These were released on February 16 and I picked mine up at a convenience store for 99 yen ($1.06). The bag contains 55 grams (about 2 oz.) of corn snacks which will set you back 295 calories if you snarf it all down. The web site talks about how these are meant to resemble ramen flavored with "thick brown oil", pork bone, ginger, and garlic. 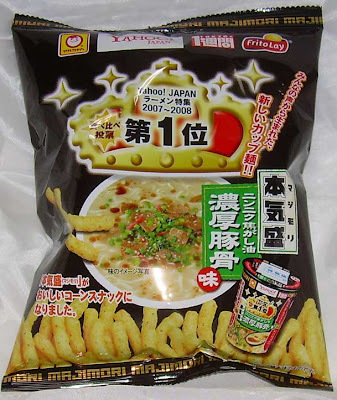 There is another ramen flavored corn snack which has been released at the same time as this one, but it wasn't on sale locally. The other one is spicy miso and tonkatsu (fried pork cutlet). When I opened the bag and gave it a sniff, I really couldn't identify the scent. It's such a melange of flavors that it defies easy identification. It doesn't smell particularly bad, nor particularly good. When I first started eating them, I had a strong sense of a lot of foreplay with no finish. There seemed to be an immense and complex hit of flavor with only a bit of an oily follow-up. As I ate more and more of them, the savory flavors separated out into pork, green onion, ginger, and garlic. Cumulatively, the garlic seems to become more and more present as the flavor builds up, but that pork bone flavor is strongly there as well. When I first started eating these, I wasn't very impressed, by about the 10th puff, I was hooked. They are so savory and complex in flavor and get better and better as time goes by. From a flavor viewpoint, this is good. From the viewpoint of eating more of something which really isn't good for you, it's rather bad. Still, this is a limited edition product which I'm sure won't be around forever and worth a one time indulgence. I'd definitely recommend trying them. Sometimes it amazes me how the weight of the packaging can weigh as much as the actual product contained within it. 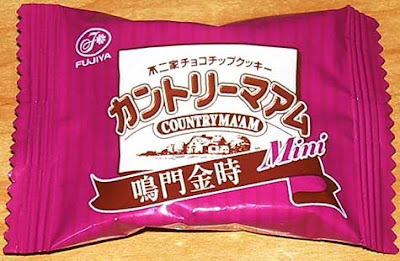 These Country Ma'am cookies are a good example of that sort of thing happening. There are five tiny individually wrapped cookies inside of an over-sized plastic package. 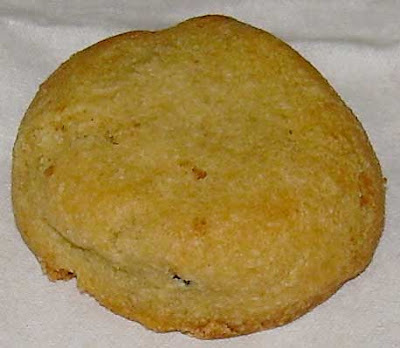 The cookies are a little less than 4 cm (about 1.5 inches) in diameter. If I could compare the volume of plastic to the volume of cookie, I'm guessing the plastic would win by a nose. These cookies are a limited edition and classified as a "premium" variety. They cost 158 yen ($1.71) which is very pricey for so few cookies. My guess is that they will vanish by the end of spring as sweet potato treats are largely confined to winter consumption. However, Fujiya doesn't mention when they will be withdrawn on their web site. The packaging, which is not represented very well in my photos, is purple and resembles the flesh of a sweet potato. 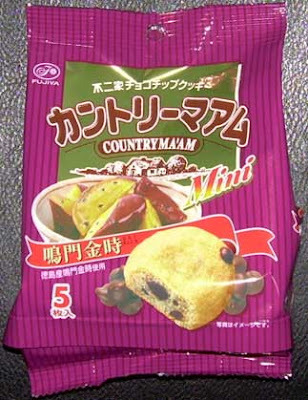 Each cookie has the trademark textural elements of the Country Ma'am brand. They have a crispy external shell and a moist, chewy interior. The cookies are so tiny though that you don't get much of a sense of their chewiness. They smell like a regular chocolate chip cookie with only the faintest hint of sweet potato. The taste hits you in two waves. First, you get a general chocolate chip cookie flavor, but a wave of super strong sweet potato flavor washes over you after it. I love sweet potato, but this was way too much even for me. It's insanely concentrated and overbearing. It's as if you're eating powdered sweet potato in the cookie. The ingredients do include "sweet potato paste", so there may indeed be some sort of heavily processed and concentrated sweet potato. The chocolate chip flavor is bold and bordering on bittersweet. It does nothing to enhance the taste and is a poor match of flavors. White chocolate chips would have been better. I'm surprised at how unlikeable this cookie is. I expected to enjoy it and ended up finding it unpleasant due to the strength of the sweet potato. It borders on tasting like what a near rotting sweet potato might taste, and I certainly wouldn't buy these again. The word "sale" has very little meaning in Japan. Oh sure, they have sales, but usually the discounts are pretty paltry. There are tables of discount food items at most of the big markets, but most of the items are marked down by between 3 and 20 yen (that's about a nickel to 25 cents). This is unlike the U.S. where you can buy a nearly expired packet of cookies for a dime. Because the items are not very popular (and therefore are likely not very desirable) and the discounts so lame, I have never bought one of those items, until today when I ran across this kinako giant Pocky. The discount on it, by the way, was a whopping 16 yen (about 14 cents). I've seen giant Pocky before and I figured I'd get around to sampling one sooner or later, but it was the kinako (toasted soy flour) that drew me to this. With visions of quasi-peanut butter flavored Pocky dancing in my head, I tossed it into the shopping basket. When I checked Glico's site and their current assortment of Pocky brands, these did not show up. After searching a bit more creatively, I found a press release site which ties the release of these to setsubun (the day before a season changes, in this case, from winter to spring) though these were released on December 17, 2008, far earlier than the changeover from winter to spring. 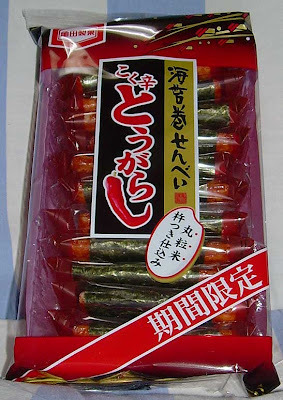 I believe that these are kinako flavored because toasted soy beans are used in setsubun activities. One interesting point on the press release page is that they specifically state that the target demographic for this product are males and females ages 10-20 and housewives. Though "kaburitsuki" translates to "ringside" (something that came to mind from the days when we were sumo fans), I'm not confident that that is the proper word because it makes so sense. Are we to consume these from or "ringside" seats as we watch the seasons change? I'm sure that someone in the know will offer more information if I'm translating incorrectly here. "Giant" in Pocky terms is 22 cm (8.6 inches) and about 1 cm in diameter (.4 inches). There are three individually-wrapped sticks in a box that could easily accommodate four of them if Glico weren't so stingy. 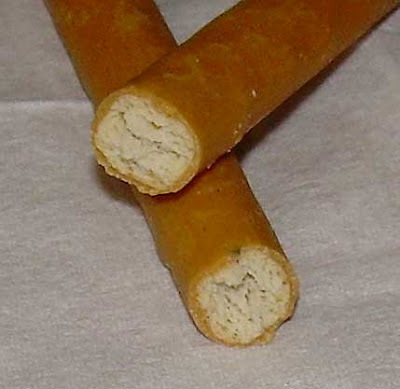 Each stick is 60 calories and weighs 12.4 grams (.4 oz.). This box retails for 160 yen ($1.74), which doesn't represent the best value for the volume. The sticks are very heavy on the pretzel and light on the coating, particularly for their size. When you compare the amount of coating to something like the Dessert Pocky series with its lavish coating on small sticks, it seems very stingy indeed. However, perhaps they didn't want these to be too sweet or fattening for young people. The sticks smell nicely of toasted soy flour and have almost impossible to see flecks of brown rice puffs in them. The illustration shows them more clearly than the actual sticks do. (Click on the images in this post to see larger versions.) The taste is lightly sweet and pleasant and the texture is crunchy. They are thick, but not hard to bite through. Though the kinako taste is definitely there, it is largely overwhelmed by the pretzel stick portion. What is more, only about 2/3 of the stick even has a coating. A large portion at the bottom is just a thick, plain, unsalted pretzel. The bottom line is that the proportions are such that they taste a lot more like a kinako breadstick than Pocky or even a pretzel. Since I enjoy breadsticks, I liked these. However, I think that they will be far less satisfying for Pocky fans. If you see these in an import shop for an inflated price, I wouldn't recommend buying them unless you're a huge lover of breadsticks. If you see them in Japan and are bonkers for kinako, they're worth picking up for to sample, but probably not for repeat snacking. When you think of Japan, you don't think of them being "corn-fed", but it is the largest consumer of corn crops from the United States and their appetite for imported corn just keeps on growing. Most of the corn is used to produce processed foods rather than eaten as fresh corn. One of the most popular corn-based products is corn potage soup. You find it for sale everywhere as a powdered "cup-a-soup" style drink, but also in refrigerated and frozen food sections as "heat and eat" soup. Corn potage soup is made with cream, butter, onion, and various spices. It's a mixture of slightly sweet corn with rich, creamy fatty flavors and savory elements. These sembei are meant to offer the flavor of that soup on a salted snack. The front of the bag touts "super sweet corn powder" and "milk" as ingredients. Flavorings include a lot of different powders including corn, cheese, "super sweet corn", onion, butter, and whey. I picked this up at a Family Mart convenience store for 218 yen ($2.32) and there are 17 large (2.7 in./7 cm. diameter) crackers in it. Each cracker is 38 calories. When you open the bag, you are immediately hit by the scent of the same type of flavors that come with instant corn potage soup: corn, cheese, and onion. The texture is very crispy and these were very fresh. When you put then on your tongue, you get a strong sense of their buttery flavor followed by sweet corn. These are both sweet and salty at the same time. Personally, I find them to be incredibly delicious and I had to will myself to stop after 3 crackers. I recommend that you seek these out and buy them while they're available. These are a limited edition that are only being sold in convenience stores for about 4 months. I don't know when they were first released (the information is not on Kameida Seika's web site), so act fast. Sequoia is one of those candy bars that has been around since I first arrived in Japan 20 years ago. In fact, I vaguely recall sampling it when it could only be purchased in chocolate and cost only 20 yen and being singularly unimpressed. I've passed on the numerous bars I've seen in both chocolate and strawberry flavor at the local 100 yen store despite their taunting me with their shiny plastic packaging and low, low price of 33 yen (35 cents) a bar. Because of this low estimation, I never would have chosen to purchase this caramel bar for myself, but my husband saw it as a new product and bought it for 40 yen (43 cents) at a Lawson's convenience store near his job. The Sequoia brand bars are named for their resemblance to a log of wood (the Sequoia tree). This seems like a strange marketing idea as food products that bring to mind splinters, moss, and sap, not to mention something so hard you can't bite through it, don't tend to get mouths watering. All of the bars have simulated wood grain embossed into them. 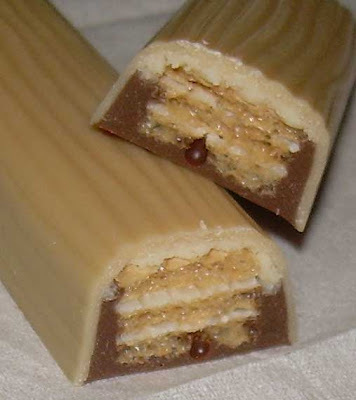 This works particularly well with the caramel bar because its lighter color makes it resemble a log rather than a chocolate bar with grooves pressed into it. Sequoia is what I'd regard as the signature product of Furuta, a company which makes a lot of candy in small portions for kids. Furuta evolved from a chocolate and cookie business in 1952, though it didn't officially become a corporation until about 10 years later. Their original product line was "candy toys" and they make chocolate eggs with toys inside. They also make small Thomas the Tank and Mario toys as well as "collections" of various animals (dinosaurs, dogs, cats, etc.) that adults and kids alike collect and display in plastic cases in their homes. The toys are sold near the candy in supermarkets for around 300 yen ($3.25). Though I've never bought the toys so I can't say for certain, I don't think they contain any actual candy. Since I had a so-so experience with Sequoia and rather bad experiences with caramel Japanese candy, I was expecting very little of this bar. I was surprised when I opened the wrapper and saw that it's not all caramel and that there's a chocolate base. I was also encouraged to not smell a super strong or fake caramel scent. There is a hint of caramel and chocolate, but mostly, it just smells "sweet". One thing which is surprising about the bar is that the wafers have the look of authentic sugar wafers. While you can buy all sorts of wafers in Japan, none of them resemble classic sugar wafers with a firm white layer of cream between layers that you can buy in the U.S. This is likely because they'd be too sweet for the Japanese market. Most of the wafers in Japan are very bland and, for some reason, fortified with vitamin E.
The texture is different based on what part of the bar you're eating. The top is very soft and yields easily. The white chocolate under the caramel coating is almost soft enough to be ganache. The bottom is solid and firm chocolate. The wafer is crisp and fresh with a super sugary cream. This is quite sweet, but with a bittersweet chocolate finish that helps balance out the sweetness. It has a mild caramel flavor which is not overly artificial or overwhelming. This bar completely works because the sweetness is carried by the wafers and their filling and not by the chocolate or the caramel coating. I rather expected to hate this, but I loved it. It is very sweet, but it didn't burn my throat. The balance of flavors and texture just come together very well and the mix of caramel, chocolate, and vanilla adds depth to the flavors. If you can stand some pretty sweet stuff once in awhile, I'd strongly recommend this. I can say without reservation that this is the best caramel candy bar I've had in Japan. Since starting this site, I've been debating whether or not I should add a rating at the end of the post as a way of "ranking" the desirability of a particular food. I'm not sure how valuable such ratings might be, so I'm putting up a poll to ask what my readers (all 200-300 of them) think. If you'd like to see me add a system like a scale from 1-10, a star system, or whatever, please vote and if you have a particular preference, please leave a comment. There are entire sections in markets and convenience stores with tiny packages of "healthy" snacks. I usually ignore these sections because they are mainly full of dried out cookie, cracker, and cake items fortified with vitamins, minerals, and artificial flavors. It's not so much the fact that the flavors often taste like esters cooked up in a chemical lab that puts me off as the tiny, tiny portions for a relatively big price. 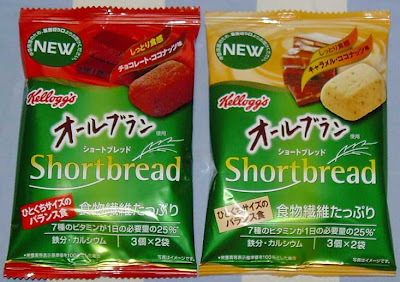 These cookies are brought to us by Kellogg's, which is well-known in the United States, but not so much in Japan. The Japanese don't go much for breakfast cereals because they want something with greater substance for their morning meal. They have learned what we have not (about cereal) in terms of its longevity in satiating hunger. That is, that you eat it and feel hungry two or three hours later. Most of the Japanese folks I speak with about breakfast have rice or toast with soup of some kind. There are Kellogg's cereals in Japan including variations of Special K and some sugary kid's stuff, but you don't see much compared to American cereal aisles. There are several healthy cookies stocked near the cereal, and the "All Bran" brand has been parked in these sections for quite awhile. Their main selling point is, of course, fiber. 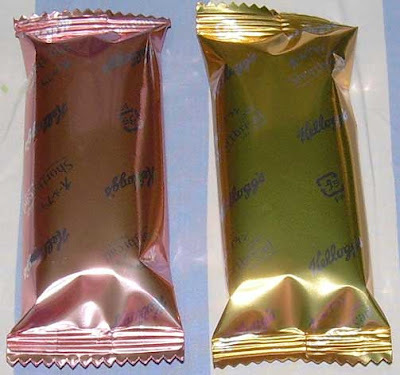 Each package contains two foil packets with three tiny cookies in each. When I say "tiny", I mean it. They are 3 cm. (1.2 in.) by 2.3 cm (.9 in.). The nutrition information says that there are about 150 calories if you eat both packets (30 grams/1 oz.) and they are fortified with 7 vitamins and calcium. There's quite a bit of sugar in these on balance with the fiber. 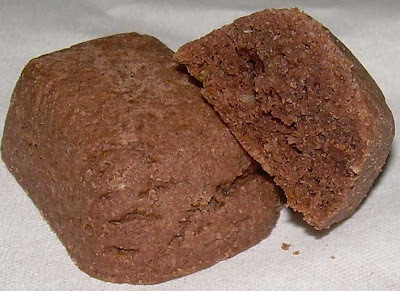 The sugar content for the chocolate version is 14.6 grams compared to 4.3 grams of dietary fiber. The advertising for these sells them as "moist" cookies. 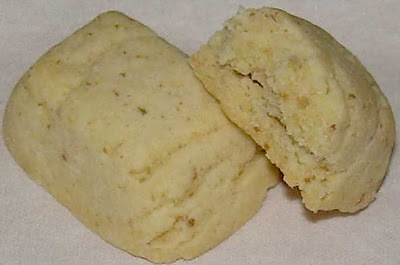 They are crumbly and dry, but infused with enough fat to make them less brittle than you'd expect given their texture. Both varieties have the same texture, but drastically different flavors. The caramel smells strongly of artificial caramel and tastes overwhelmingly of it. The first bite is especially unpleasant due to the strength of the faux caramel. There is coconut in with the caramel, but that isn't enough to salvage the flavor. This was so bad that I couldn't eat more than one tiny cookie. The chocolate cookie smells pleasantly of cocoa. The chocolate taste is a bit weak for my tastes, but that is saved by the presence of coconut. It's not bad, but does have a strange artificial finishing flavor. It wouldn't really satisfy a cookie craving, but it might do in a pinch for a quick breakfast on the go with some tea or coffee. This one is definitely more palatable than the caramel one. The main point of these types of foods is that they want to fool you into thinking they're good for you. It's true that they are probably "better" for you than eating, say, an Oreo cookie, but they're probably worse for you than something like a homemade oatmeal cookie because they're full of chemicals and vegetable oil. From a purely sensory based point of view, I can't recommend these, but if you have really bad eating habits and want to eat vitamin enhanced junk food, I could condone the chocolate ones in a pinch. The pink square at the top says in English, "The good jelly by which a fresh fruit was made with fruit juise (sic)." In the modern world, one of our biggest quests is to be able to find something which is traditionally considered bad for you and alter it so that it is good for you. Kanten, which is the Japanese word for agar agar, has the potential to be that sort of food. 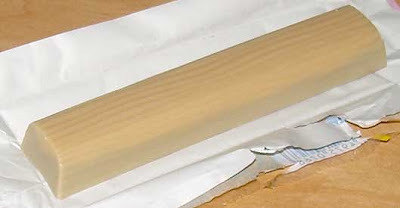 Kanten is derived from seaweed and is 80% fiber. When you eat it, it expands in your stomach and absorbs water so you feel fuller. There are a variety of Japanese sweets made with kanten and jelly candies like the one I'm reviewing in this post are one of the easiest ways to enjoy and ingest kanten. These candies look like a Sunkist fruit gem. They're covered in sugar and have a similar texture to a fruit gem, though they are a bit softer. The sugar on the outside isn't as grainy as those on American jelly candies, which is somewhat disappointing as I like the contrast of the texture of granulated sugar on jelly candies and the jelly interior. You don't really get an impression of the texture of sugar, but you do get the sweetness. These candies smell a bit like pears or peaches. The taste is very peach-like and quite sweet, though not in a throat-burning way. These are quite pleasant, but I'd prefer a citrus-flavored jelly so that there was some sourness or citrus bite to offset the sweetness. The company that makes these has no online profile, so I couldn't find out anything about them including whether or not their product line includes other flavors. The bag contains information about ingredients, but no calorie details. Since the first ingredient is sugar, and the second water, I'm guessing these aren't exactly healthy. However, you may find eating one or two more satisfying in the long run than a similar quantity of another sweet if the claims about fiber, expansion, and water absorption hold true. You can buy kanten sweets in most Japanese markets. In fact, I've bought variety packs of Japanese candy before which included these types of jellies in other flavors, but these ones were much higher quality than the ones I've had before. Mainly, these have much better fruit flavor (real fruit is used) and a stronger taste overall than the average supermarket variety. These would make a nice souvenir for people who have outgrown super sweet candy or treats, or suit people who like jelly candies but want something with a potentially better nutritional profile. I'd definitely buy these again some time and I'd buy larger quantities if they had a citrus version. Since today is Valentine's day, I saved an item that was clearly released for the holiday. It contains the Valentine's candy flavor trifecta - red fruit (cherry), chocolate, and alcohol (cherry liqueur). In fact, it proudly announces that there is .4% alcohol in this candy on the box cover. Inside the box, there are two little conjoined trays with foil covers. They look like they should separate in the middle, but they can't be pulled apart. They packaging is like this so you can bend the sections in the middle while keeping two portions in separate trays. Each little "twig" of candy is about 5 cm (about 2 inches) long and there are 8 in each compartment. They are 22 calories per stick. These smell vaguely of chocolate, cherry and alcohol. The sticks are soft and melt easily in your mouth. The filling is like a firm ganache, though the coating is not very firm. It has a low melting point, though it doesn't melt in your hands. These taste like cherry cordials though their texture is very different. The flavor strongly reminds me of Cella's chocolate covered cherries. Since I used to love those when I was growing up in the U.S., I liked these a lot. These aren't too sweet though they have a bit of a sharp flavor from the alcohol. I can see where some people may find them medicinal because cherry cough syrup contains alcohol and these incorporate similar flavors. I think these are very nice and I'd revisit them again without reservation. However, if you are the least bit of a mind to dislike any of the risky component parts (cherry and alcohol), you might want to give them a miss. Edamame is a young soybean served in its pod. It's often boiled with salt and then eaten whole, usually with beer. Most of my experience eating edamame in Japan has been at Japanese bars (called izakaya). For a bean, they are pretty darn tasty. My husband isn't a great fan of things in the vegetable oeuvre, but he does like these. Edamame is currently hot with the foodie crowd in the West right now. It's become quite the fad if you believe food blogs. People who are too erudite for the likes of green beans talk about using edamame. To be fair, these do taste better than green beans or peas. Nonetheless, I will continue to imply that they are snobs, while secretly agreeing with their preference for these fine beans in a pod. 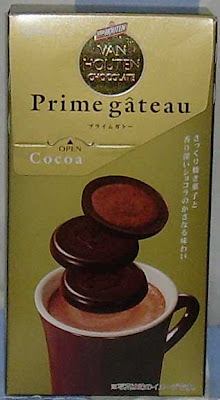 I picked these up in a local supermarket for 200 yen ($2.24). The entire bag is 90 grams (3.2 oz.) and contains 6 small packets. There are about 15 small crackers per packet. If you do the math, you learn that each little bag has 65 calories. Compared to something like potato chips, they are slightly less caloric and have just about the same amount of fat. They may be a little better nutritionally since they are made primarily with soybeans, followed by rice, and vegetable oil. 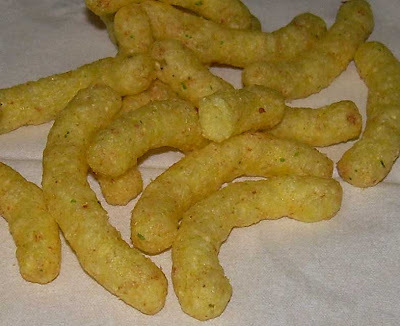 They also contain a small amount of peas, though peas comes later on the ingredient list than salt so it can't be many. 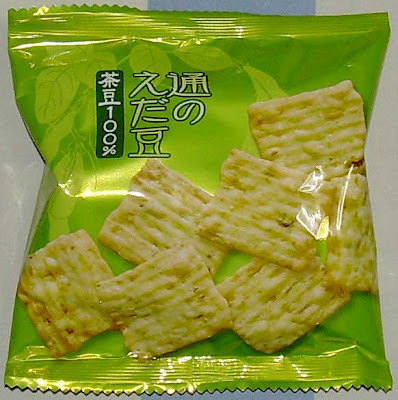 These are brought to us by Kameda Seika, maker of a wide variety of rice cracker snacks. Most recently, I reviewed their cayenne pepper sembei. Since I like edamame, but am so-so on sembei, I wasn't quite sure how I'd react to these, but I was looking forward to trying them. The truth is that I'd been eyeballing these in the store for awhile before I took the plunge. I wasn't apprehensive, mind you, but just had too much other stuff to try. They smell like edamame which is no great surprise. They also have a hint of the usual rice cracker scent. Each cracker is super crispy and perfectly salted with what appears to be extra fine salt. There's a bit of a chlorophyll flavor in there, like a smidgen of grassiness. Though there is a lot of edamame in them, it's not an overwhelming flavor. It's well-balanced with the blander toasted rice flavor. These are immensely satisfying as a salty snack treat and more earthy and natural tasting than a potato chip. I'll definitely buy these again and strongly recommend them to anyone looking for something more interesting than a chip, but still desiring the same salty and crispy aspects. I bet these would go great with guacamole as well or a sour cream-based dip. The only thing I wish was so was that these were lower in fat and less caloric. That's mainly so I could feel good about eating them from a nutritional viewpoint rather than only from a satisfaction perspective. I had noticed this box of Van Houten cookies at the local market for several weeks before GirlJapan encouraged me to buy them. Though I'm a fan of Van Houten, I had been resisting them because of the price, and the fact that I've had an overabundance of chocolate goodies on hand since before Christmas and I'm trying to focus more on other types of snacks for variety. However, it really doesn't take much arm-twisting to encourage me to sample something chocolate. These are essentially a chocolate covered crispy cookie. There are 8 small cookies (about the size of a half dollar) in the box. They smell like cocoa, unsurprisingly, since that is what Van Houten does so very well. 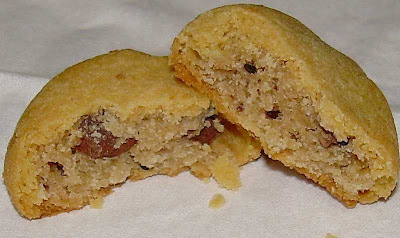 The chocolate on the outside is mildly bittersweet and the tiny cookie is super crispy and fresh. The flavor is very deep and intense. It's sweet, but not too sweet. When my husband tried it, he said that it actually tasted like a cup of hot cocoa in cookie form. Ironically, this is exactly what GirlJapan said as well in her recommendation of them. It's quite a feat really, and my hat is off to Glico for fulfilling the promise of the box's cover graphic. What is more, each cookie is only 33 calories and you don't really need to eat more than one to get a fix. These are excellent and my only reservation is that they're slightly expensive. Eight small cookies are about 170 yen/$1.90 a box. However, these should be considered a "premium" cookie despite the fact that they are mass-produced. As a small indulgence, they are well worth the price. So much Japanese candy is adorned with cutesy little cartoon mascots. It's almost refreshing to see a ferocious, snarling bear on the front of one the them. In fact, I really wish I could send a case of these to Stephen Colbert. I'm sure they'd be all the more appetizing to someone with his unique appreciation of the less cuddly nature of bears. Some might doubt the marketing value of putting a creature that looks like it would enjoy nothing more than mauling you on a box of sweets, but it can't all be Pikachu and Totoro. 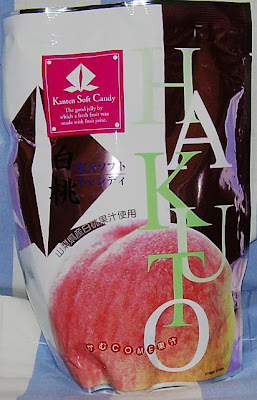 These candies are a souvenir from Hokkaido, though we picked them up at a candy shop in our neighborhood in Tokyo. Somehow the whole Japanese regional food obsession seems a little less understandable if you can get these types of things anywhere outside of their specific regions. The box has one of those long-winded statements in English that you sometimes find on Japanese products. For the record, most of these assertions are earnest and about nature preservation or appreciation. I'm told this sort of thing plays well with the locals, but mainly as a decorative element as most Japanese folks don't bother to read the English (or understand it). To me, these statements have always come across as a bit corny, but they're not there for the likes of me. These are made by a company called Dounan. The company is located in Hakodate in Hokkaido (northern Japan) and was established in 1919. Their Ezo Brown Bear line includes 3 flavors of caramel chews and a few chocolate bars. 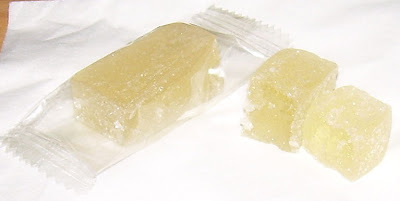 They make a variety of caramel "chews" as well as a few drinks and other sweets. One of the more interesting items they make is chocolate-covered freeze-dried strawberries. If I could get my hands on them, I'd love to try their corn chocolates and caramels. The corn chocolates look like little cobs and are just darling. Everything they make can be purchased via mail order from their web site if you can understand Japanese, though I'm betting they only ship domestically. 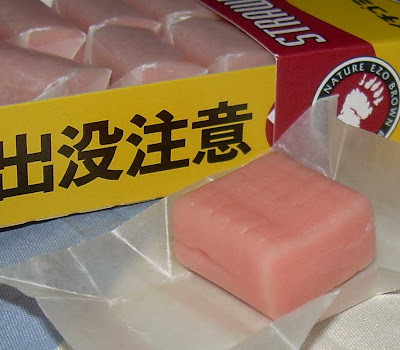 The box contains 18 strawberry milk chews which are 1.5 cm (.6 in.) x 2 cm (.8 in.) in size and wrapped individually in wax paper. The box could easily fit 20 candies because there's a long gap at the top, but I guess that they're being a little cheap or someone didn't design the box properly. The candy smells faintly of real strawberry and each is firm to the touch. When you put them in your mouth, they're slightly sweet and a little tart. They're pleasantly chewy and easy to bite into. There's a hint of milky flavor as well. They're like a soft Tootsie roll in terms of texture. They're not as slick or gum-like as a Hi-Chew. These have a very good and natural strawberry flavor. It's mild because of the milk, but the flavor is clearly present and well-balanced. These are definitely worth a try. Even if you hate strawberry, you should buy them for the nifty box. 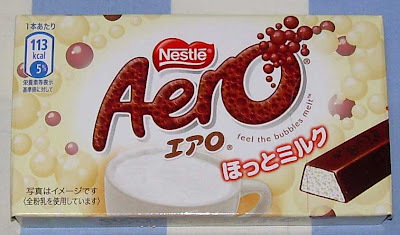 The Aero bar is Nestlé Japan's lesser loved child. Of course, daddy's favorite is the oft-manipulated KitKat. 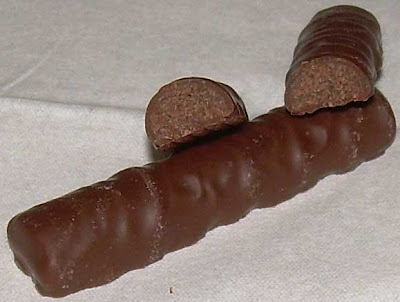 The original Aero is a chocolate coated bar of aerated chocolate. 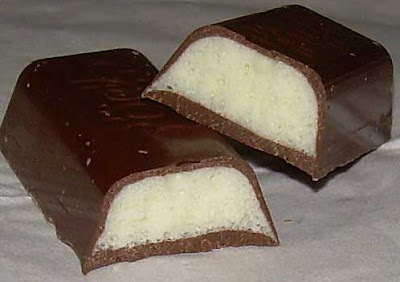 This variation is pretty much the same bubble-filled bar with white stuff inside instead of brown stuff. Nobody has taken notice, but the Aero has seen quite a few flavor variations as well. They have included banana, melon, peach, green tea, strawberry, tropical fruit, and lemon soda. No, I didn't notice these flavors in the shops. I had to look it up on Japanese Wikipedia. In some world where my anthropomorphized fantasies about candy bars have become a bizarre reality, I'm sure the Aero has intense sibling rivalry with the Japanese KitKat. They probably fight over lollipop girlfriends and compete for their parent company's affection. At any rate, all of this fanciful writing is a cover for the fact that this is one boring bar so there is little to say about it. It comes in a box with two individually wrapped bars at 113 calories per little bar. It smells like cocoa, is quite sweet, rather milky, soft, and very melty. The big point of the Aero bar is that the bubbles are supposed to melt in your mouth and you can feel them. I can't feel them, but it does seem like the chocolate disappears super fast with all of that air in there. This is a nice enough, if somewhat sweet and pedestrian bar, but it tastes just like plain Japanese milk chocolate with a bit of an acidic aftertaste. The hotto (hot) milk portion doesn't seem to do anything at all for it. It's utterly unremarkable except for the fact that it is airy. I guess that's why Japanese KitKat variations attract so much more attention than Japanese Aero variations. Sometimes Mom and Dad have a favorite for a good reason. When I saw this little square of chocolate for 30 yen in a Family Mart convenience store, I was happy to see another "mochi" version of a Tirol candy. For those who don't know it already, Tirol sells small square candies either as part of variety or multi-packs or "premium" candy in 1 inch square (2.54 cm) sizes. The ones in the variety pack are about the same volume as a Hershey's Kiss, perhaps a bit bigger. The premium ones are about 1/3 larger than the small versions and sell for 30-40 (about 35-40 cents) yen each. 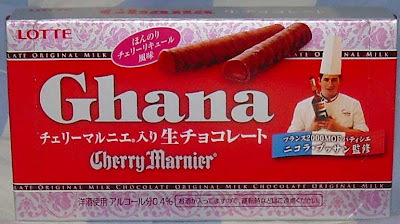 I'm pretty sure that this newest flavor was released to cater to the Valentine's Day buyers as well as get a leg up on spring-themed treats since "sakura" is cherry and cherry blossoms are all over the package. 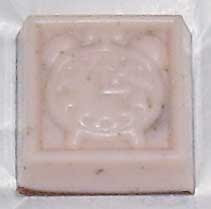 The premium candies are molded with different designs on them. There are only 5 picture designs, a rocket ship, house, clock, car, and an airplane, and a basic checkerboard pattern. I think this is a good reflection of the fact that the companies earlier offerings were geared mainly at kids, but I believe the premium flavors may be equally oriented at the adult market, particularly the sweets hungry "office lady" (OL) crowd. The top of the candy is pale pink tinted white chocolate with what I'm guessing are supposed to be little specs of cherry. 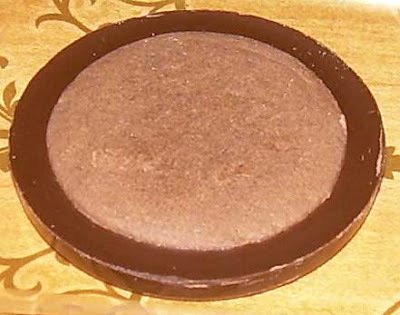 The base appears to be regular milk chocolate. 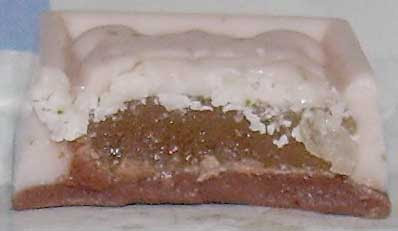 Inside, is the "mochi" gummy center which is a brownish blob. I was disappointed that there was no flavored "sauce" on the top as there has been in some other Tirol premium candies. The candy smells like cheap cherry-scented perfume or air freshener. It's not a good smell. Unfortunately, it tastes like overly sweet cheap cherry perfume or soap. The coating is soft and carries all of the flavor. The chewy gummy center doesn't have much taste at all. This was really quite dreadful, and a huge disappointment. I'm pretty tolerant of strong flavors and tend to favor them over bland ones. I also like cherry quite a lot, but this was a real failure in flavor balance. This is probably one of the worst things I've ever had and tops the Oshiruko KitKat as my most disliked snack food. I guess that means I'd rather eat a moldy sock over a bar of soap, not that that's a competition I'd relish taking part in. Last time I was in a convenience store, I noticed a box of Dars chocolates with backwards writing on it. In every way, it looked like a regular box of this particular variety of chocolate. I couldn't understand what the point of the reverse writing was until I came across an article on Japan Marketing News. 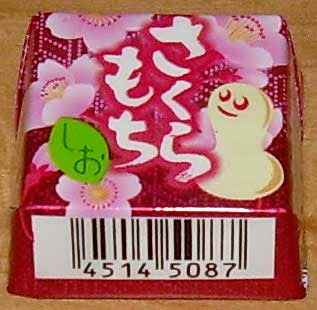 Apparently, the reverse writing is an attempt to get Japanese men to buy Valentine's candy for Japanese women this year. Since the tradition has been for women to give men candy on February 14 and men to return the favor on March 14 ("White Day"), the candy companies want to encourage men to "reverse" the giving and give women chocolates on Valentine's Day. It's probably a good ploy. Most of the Japanese women who I have spoken with about the White Day holiday say that the vast majority of men do not reciprocate for the Valentine's candy the women around them gave them. It'd probably be far better for sales if both men and women were on board for Valentine's Day. From a commercial point of view, White Day has generally been a bit of a failure. In order to fulfill the notion that I'm doing this blog to sample new things, I have to stop showering myself with new flavors of KitKat and try some things which are more than simply the same main character cast in a different, but very similar play. I'd also like to stop eating so many sweets so I picked up this package of sembei at the local 99 yen store. It won me over with its promise of cayenne pepper hotness even though I am not a fan of either sembei (rice crackers) or nori (seaweed paper). 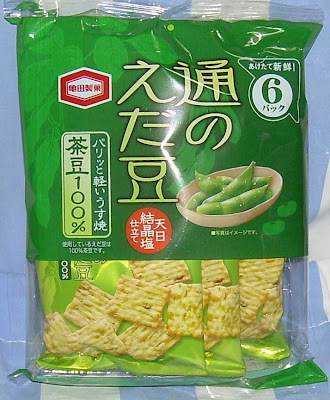 This sembei is made by a company named Kameida Seika, which makes a wide variety of sembei-based snacks and is the biggest maker of rice crackers in Japan. The company was started in the 1940's, but has since been reorganized several times and no longer bears much a resemblance to the business that started it all which was co-owned by a farmer. Like many food manufacturers in Japan, they are looking to diversify and expand their product line in order to increase sales despite the falling birthrate, and they hope to offer sweets and health foods in the future rather than mainly focusing on rice-based snacks. On the company's web site, they mention that these are especially good in winter, presumably because the cayenne chili flavor will heat you up. Since it is winter, I guess I picked a good time to try these. The packaging for these crackers is a brilliant example of the convenient, but over-the-top packaging in Japan. The crackers are each individually wrapped, placed in a plastic tray and then wrapped in a plastic wrapper. This keeps each cracker in great shape and allows you to leave the main bag gaping open without any fear of allowing the remaining crackers to go stale, but I frankly feel guilty about all that plastic. The crackers look great. 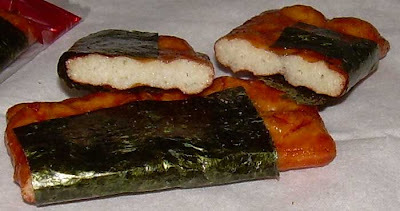 They are shiny, slightly red tinted, and partially wrapped in a crisp square of nori. Once liberated from their individual plastic prisons, they smell slightly of soy sauce and cayenne, though the cayenne has a bit of a tomato scent to it. You can also smell the seaweed if you sniff the part with nori on it. 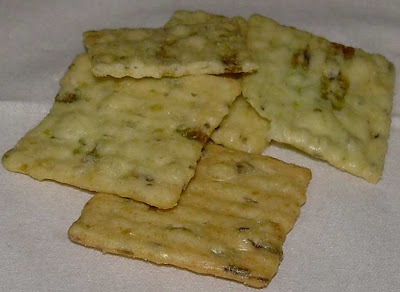 The texture of the crackers is very crunchy, with some flaky areas on the surface where they have bubbled up during baking. It's very satisfying from a texture point of view. When you bite into it, it cracks off easily, but the nori doesn't tear very well alone the line of your bite. The first thing you really get hit by taste-wise is the seaweed, soy sauce and a fishy taste. This is followed by some cayenne pepper heat. The second bite gives you more of the flavor of a classic rice cracker. This flavor is hard to describe if you've never had sembei, but if you have had it, you'll know exactly what I mean. 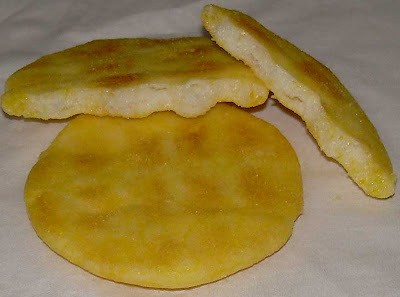 All rice crackers carry this taste no matter what flavoring has been applied to them. The ingredients include rice, soy sauce, sugar, seaweed, hot pepper paste, mirin (sweet Japanese rice wine used in cooking), and seafood extract powder. This explains pretty much the entire range of flavors in the cracker. Personally, I could do without the seafood extract powder as I don't like overtly fishy flavors. There are 11 crackers per bag and there are 215 calories for the entire bag (about 20 calories per cracker) so this wouldn't be a too fattening snack, particularly since one is unlikely to eat an entire bag at once. I probably wouldn't buy these again because, while I don't hate these, I don't love them either. I think they are very well made and enjoyable, but I don't think they suit my tastes. I love the heat, but not the fish or seaweed flavors, which I can certainly tolerate without difficulty, but find distracting. If you're a fan of all those flavors, these are definitely worth sampling. I finished off the bag, but I also pulled off the nori wrappers on them to do so.